Welcome to the first post for the Holiday Gift Guide 2012 here at Minding Spot! We have a great line-up of super products, food and other extra special things in store for you within the next month or so. Since we love books, we thought it only right to start out our guide with books!! U Star Novels lets YOU star in a classic book. We looked through all of the books on the site, and there is quite the variety - from romance to eBooks to classics to vampires! But, my daughter loves Alice in Wonderland, so I knew I was going to choose that one. Then, I had to decide who was going to star in it! Who would play Alice? The white rabbit? the Mad Hatter? You get to choose five of the characters. Of course I had my daughter play Alice and included a pet as well as siblings to play other parts. Basically, if X = Alice, everywhere in the book that the word Alice is mentioned, it's replaced with X. Then, you get to put the name on the title. So mine is X's Adventure in Wonderland. But it doesn't stop there! You also get to fill out what you want on the dedication page. Depending up the book, there are different options. I had so much fun filling in the blanks and when the book came, which was very quickly, I was entranced. It's just a perfect, unique gift that I know my daughter is going to treasure for years to come. Unique, personalized and can be used as a just because gift or a thoughtful, considerate gift to anyone who loves to read. You can purchase your own personalized book for only $24.95. 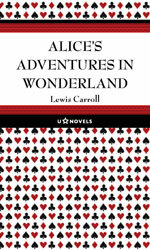 One lucky reader is going to win their own copy of Alice in Wonderland! Only you get to choose the personalization! I tried to do the rafflecopter but it doesn't like me and won't accept my entries. =( I still wanna show my support tho! Nothing like interacting with the characters in the book. Sounds like you had a great time.